ALTAR * U.S.A. 2016 Dir: Matthew Sconce. 84 mins. 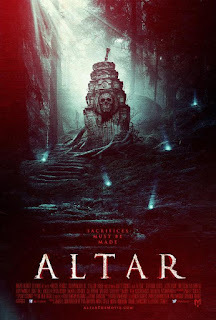 For once, the obsessive filming of a found footage movie protagonist feels convincing in ALTAR: the hero is a grieving young man with “borderline Asperger’s” who documents a hiking trip with his sister and friends because he feels his late father would have approved. Sadly, the film itself – following the familiar path of characters stranded in a noted murder spot thanks to car trouble – is riddled with clichés and tedious padding. Cell phones have no signal, the most irritating character stages a hilarious “prank” for the sake of a cheap scare…and the dull characters talk like they are permanently stuck in a post-SCREAM late 90’s slasher movie. That means saying things like “You never go back to the creepy grave site…we’re smarter than the people in scary movies, right? !” The build-up is arduous and overloaded with yawnsome character stuff at the expense of any atmosphere, while the final ten minutes finally unleash a flurry of limp horror and violence – alongside the standard BLAIR WITCH-style direct-to-camera confessional.